Facebook has announced that it will launch some new features regarding its suicide-prevention toolkit to help people who are in need of support and care. For months, Facebook was in talks with different people who have tried to commit suicide in their life. The social media giant was also consulting with organizations who help people with disorders and suicidal thoughts. Facebook announced in a blog post that it will roll out features which will allow its users to ‘report’ any user they see on Facebook, who seems to be in danger. It was not explained exactly how one could detect that his friend or acquaintance is considering to commit suicide. Perhaps the only way to judge is by smart trend analysis and algorithms working at the back end of the Facebook. It’s important to note that back in 2011, Facebook launched a feature that enabled the people having troubled thoughts to connect directly with a counselor. Facebook said that it is working closely with clinical and academic partners to work out a solution that could help users to locate and detect their troubled friends. The feature will be launched in the US in the coming months. Facebook is taking the US government on board in this endeavor. The suicide rates in the US, especially in teens are surging. 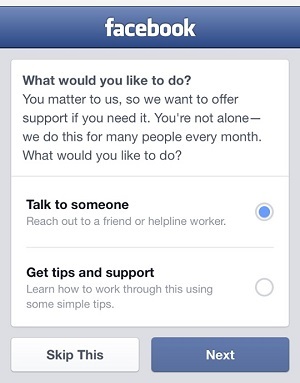 Facebook’s primary user base are millennials and steps like these will help stop suicides in the country. Moving forward, you will be report directly to Facebook via a hotline about the problems of your friend or if you think he needs help. Facebook will directly contact or send a message to the person in trouble to help him.